My sister (and realartist) Melissa Lynch sent me her newest illustrations the other day. I, of course, a little confused by the technique but excited by the images, asked if I could use them on my site. The illustrations are titled “Troubled Shores I” and “Troubled Shores II,” and refer to the ongoing Mideast-to-Europe refugee crisis. They demand some study, and with the world-wide implications of desperate people sacrificing everything to escape violence and terror, finding greed and fear and, for way too many, death at sea; with politicians using fear and hatred as campaign strategy; with radicalized assholes killing for some perverted version of what they claim is religion but is not about any god but, rather, about more power… well, we can’t help but be caught in this. It’s interesting that Melissa includes the Statue of Liberty. Perhaps the ‘huddled masses’ already here are… yes, the drawing has me thinking of things I was already thinking of, the consequences of whipped-up fear and hatred; but my worst fears are that there is no other America to run to. I sent them for your use if you want to use them. No worries if not. They are mixed media, using a transfer method for the background texture, which is images from the internet about the refugees, a photo of the Statue of Liberty, and the “Raft of the Medusa” by Théodore Géricault (1791–1824). Then I drew on that background with pastel chalk. It was for my class and the assignment was to use the “Raft of the Medusa” as a springboard to react to current events. 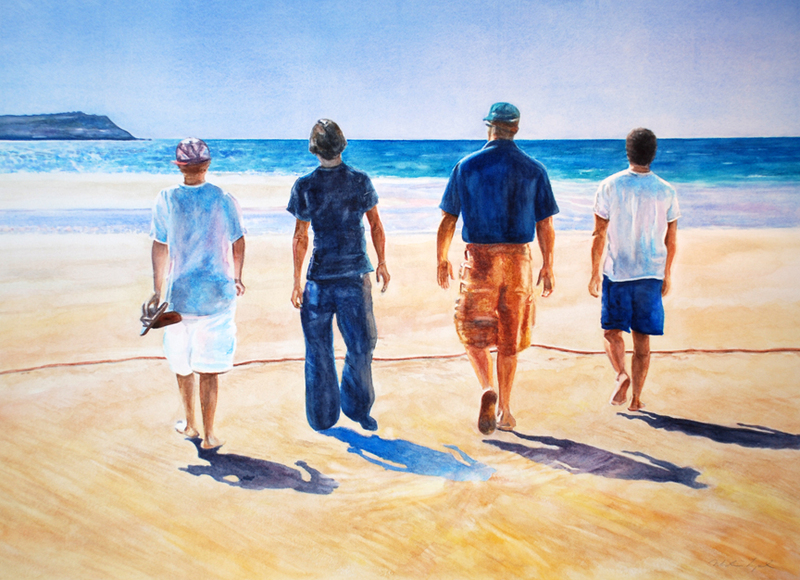 I titled it “Teeming Shores” or “Shores 2015”. 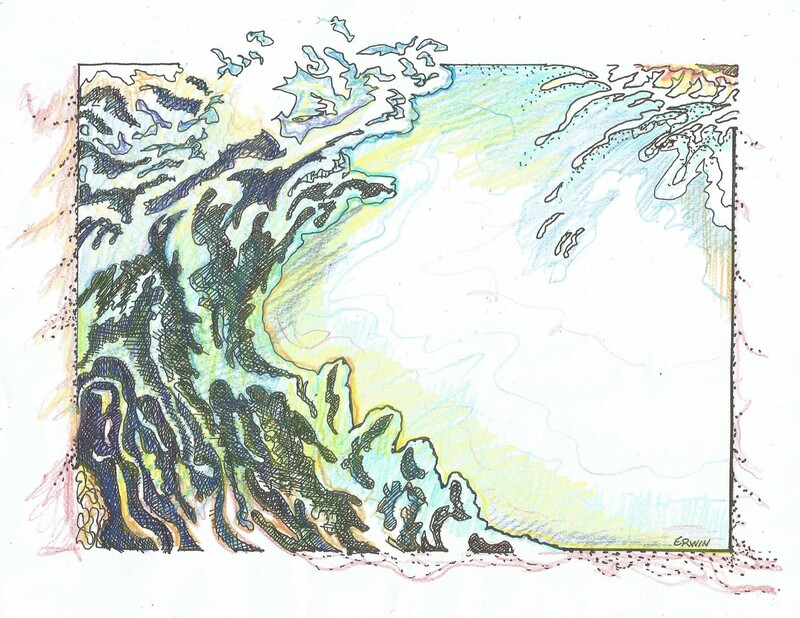 I used the same method and “appropriated” your wave illustration on an earlier piece (giving you credit of course). You might be interested in it too. If so, feel free to use it. Alternate process; Collage: Photo-copy transfers, Glue, and India Ink. * Wave background appropriated from my brother, Erwin Dence. This is a detail of a larger work which was inspired by the painting by Géricault, depicting a great tragedy. This work depicts myself playing in the sand as a child, a wave threatens to wipe me out. The woman in the foreground depicts my mother who passed away when I was very young, and my father, distraught with sorrow, and despair. The other women surrounding me and holding back the wave depict the many other “mothers” who stepped in to help protect and guide throughout my life; sisters, sister-in-law, step-mother, friends’ mothers, teachers, and aunts, and as an adult, my very dear friends. 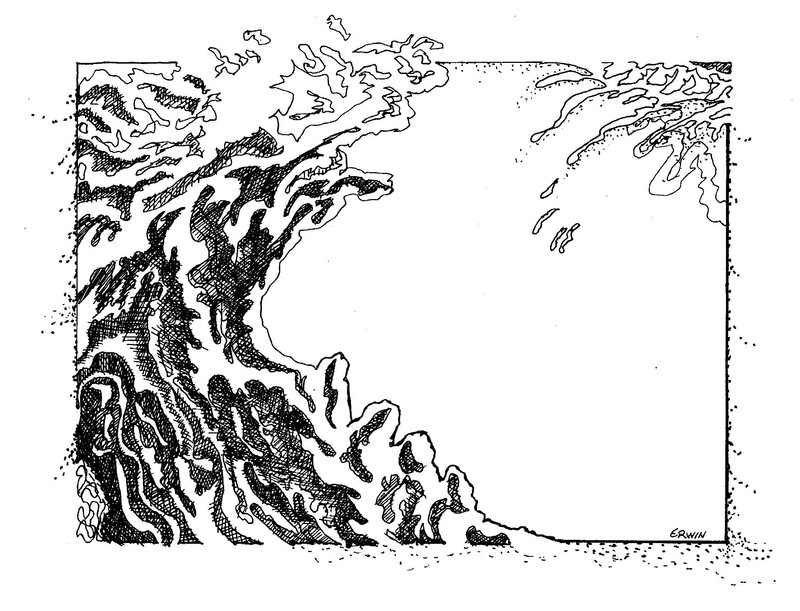 The wave itself, appropriated from my brother, though depicted here as a destructive force, also represents his help and guidance in my rearing, without which I wouldn’t be who I am today. PS. “The Ragged Line” illustration was accepted to the Illinois Board of Higher Education 1 year exhibit!